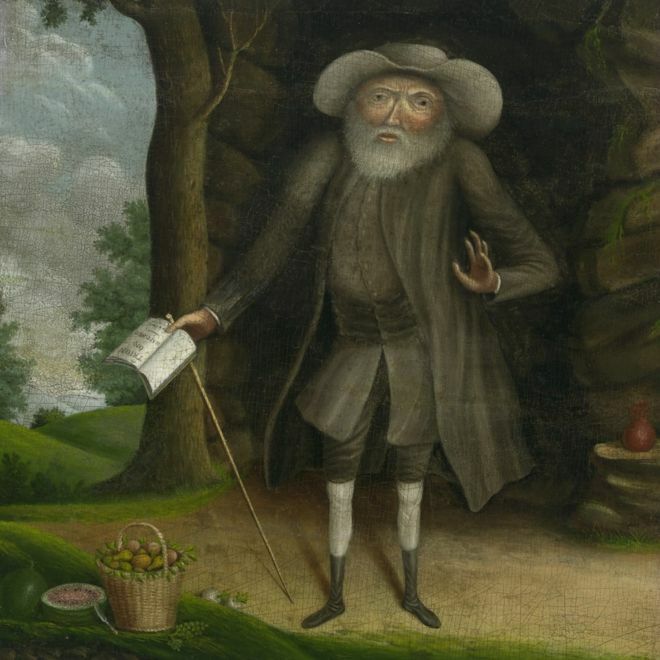 BBC item – Benjamin Lay: The Quaker dwarf who fought slavery | Southern Marches Area Quaker Meeting. This article appeared on the BBC website. Benjamin Lay was a pioneer of non-violent direct action. He stood only about 4ft (1.2m) tall, yet what Benjamin Lay lacked in stature he made up for in moral courage and radical thinking. He was a militant vegetarian, a feminist, an abolitionist and opposed to the death penalty – a combination of values that put him centuries ahead of his contemporaries. For the hunchbacked Quaker was not a product of the 1960s counter-culture but of the Essex textile industry of the early 18th Century. The BBC charts the achievements of an extraordinary man, from his early life in eastern England, to the sugar plantations of Barbados and the British territory that would become the USA. This entry was posted in News on February 10, 2018 by smaqmadmin. Hooray for Benjamin Lay! And well done, BBC! But retell the story with care in your children’s meeting: they may follow his example. Benjamin Lay was well remembered among Friends in Colchester, where I worshipped for 14 years – even more my hero than James Parnell, our local Quaker martyr. His disruptive ministry was so anticipated – or feared – that on one occasion some burly young Quakers were stationed at the meeting house door as bouncers. They shoved him away and went into Meeting. He fell into the gutter, full of foul rubbish and sewage. Colchester citizens rushed to pick him up, in pity, but “Let those who cast me down raise me up’ he declared (or some such words) Several hours later, when Friends left the meeting house, Benjamin was still in the gutter, probably still expounding his views to Colcestrians. Born in 1682, he would have known pioneering Quakers still alive, heard accounts of their provocative behaviour and admired their willingness to suffer in Truth. The civil war was cruel to Colchester, memories were still strong. I am surprised that Friends became Quietists so quickly, so completely, but Benjamin and Sarah kept the faith. In America, not only would he not wear wool, but the vegetable fibre he wore, flax, was undyed, because dyes were grown on ‘Indian’ land, or by slaves. Children loved him – one little girl happily spent all day in his and Sarah’s home. Her parents, wealthy landowners, and everyone in the village were hunting desperately for the missing child until Benjamin returned her, pointing out that her parents had recently sold a little slave girl.. Were not her own mother and father equally bereft? At Yearly Meeting in the late 80s, the under-12s explored Benjamin Lay. Red confetti represented the chokeberry (or pokeberry?) juice in the hollowed out Bible. That Yearly Meeting was in Burlington, 1738, where John Woolman had been born, eighteen years earlier. We smashed teacups with glee – Sarah was not allowed to drink tea, grown by slaves. We kidnapped each other and searched for our lost ones. We considered going out to a London gutter, but decided just to imagine that episode. The question before us was, how do you know when God is calling you to speak? How can you tell when you are self-dramatising, or humbly obedient? Is it possible to have the right message but an unhelpful delivery? When is an activist justified in breaking the law or upsetting local custom? What effect might Benjamin’s actions have had on the young John Woolman? The children discussed times when they wanted to speak but weren’t allowed to – or when they weren’t listened to – or having that twitch and quake in Meeting. Their experience of hearing adult ministry was particularly interesting. Some children had been asked to read out an Advice or Query in their home meetings, a few had been given responsibilities, such as choosing the curtains for their redecorated children’s room. The next day, in the opening worship, one of these children stood and spoke, most acceptably. It was spoiled in my view by the next rather sentimental ministry, ‘how sweet to hear a child’, that sort of thing. I just love and relish Benjamin Lay. There are lots of articles on line, there was a special issue of Journeys in the Spirit, but Rediker’s book promises even more storm and fire.